RSMSSB Recruitment 2018 - Apply Online for 309 Supervisor (Woman) Posts - Anganwadi Worker Quota in Rajasthan on Direct Recruitment. Online Applications are invited by Rajasthan Subordinate and Ministerial Service Selection Board from 04 Oct 2018 to 03 Nov 2018 till 12 Night for 309 vacancies. 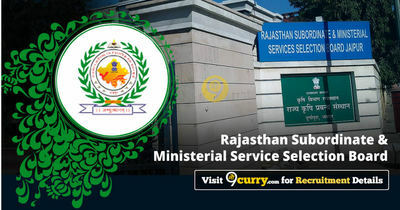 RSMSSB Supervisor (Women) Answer Key 2019: Rajasthan Subordinate and Ministerial Service Selection Board has issued the Answer Key on 25 Mar 2019 for RSMSSB Supervisor (Women) Exam 2019 which was conducted on 03 Mar 2019. Answer Key can be accessed from the link given below. RSMSSB Supervisor (Woman) Exam Date 2019: Rajasthan Subordinate and Ministerial Service Selection Board announced Exam Dates for Supervisor (Woman) Exam 2019. RSMSSB Anganwadi Supervisor Exam Cancelled 2019: Rajasthan Subordinate and Ministerial Service Selection Board has Cancelled the Anganwadi Supervisor Exam 2019. RSMSSB Supervisor (Woman) Exam Date 2019; Rajasthan Subordinate and Ministerial Service Selection Board has announced Exam Dates of Supervisor (Woman) will be held on 10 Feb 2019. Supervisor Exam Date 2018: Rajasthan Subordinate and Ministerial Service Selection Board has announced Exam Date of Supervisor 2018 to be held on 06 Jan 2019. 18 years to 40 years as on 01 Jan 2019.
i) A graduate of a University established by law in India, with 10 years experience as an Anganwadi worker in ICDS. "O" or Higher Level certificates course conducted by DOEACC under control of the Department of Electronics, Government of India. Certificates course on computer concept by NIELIT, New Delhi. Computer operator & Programming Assistant (COPA)/ Data Preparation and computer software (DPCS) certificates orginized under National/ State council or Vocational Training Scheme. On the basis of Examination. Eligible candidates may apply online at RSMSSB's website (direct link is given below) from 04 Oct 2018 to 03 Nov 2018 till 12 Night.